The aim of this competition is to open the ears and eyes of a new generation of young singers to repertoire of the Bel Canto period which is too often ignored. Preparation starts with an intensive workshop at RAM, with specialist guest coaches; this year Alastair Miles and John Mark Ainsley. Six singers progressed to the competition final where they were required to sing two arias, one chosen by themselves and another chosen for them. Finally, since opera is essentially a team effort, they were grouped together for an ensemble piece. The distinguished jury was chaired by Donald Maxwell, who not only announced the winners, but also summed up three the criteria on which judgment was based. Voice was at the forefront of their consideration, but voice on its own is not enough. Drama is an important component of opera, and singers need to make the material their own, creating a personal interpretation of the character. Last but not least there is style – this is an elusive quality, often a matter of taste, but important in terms of bel canto. The over-all standard was undoubtedly high and it was style that finally tipped the scales in favour of the winner – Jurgita Adamonyte . I thoroughly enjoyed her performance of Dircea's aria from Cherubini's Demofoonte (the earliest piece of the concert), warm toned and sympathetic, a very genuine portrayal of a tragic heroine. She followed with a real novelty: an aria from the third of seven operas by Lord Burghersh, the founder of the RAM. (Burghersh was a career soldier and diplomat, but devoted most of his leisure hours to music, and was a prolific composer in the classical Italian style. Nicholas Temperley, writing for Groves Dictionary of Music notes that his operas “show no trace of individuality, it is their existence rather their quality that is remarkable.”) This remark seems a little harsh in the light of the single aria that we heard. Runner-up Viktor Rud , also had an interesting programme, contrasting a love song from the swashbuckling Corrado in Donizetti's Maria de Rudenz with a buffo aria from Rossini's L'Italiani in Algeri . Viktor has a very expressive face and both pieces were magnificently characterised – a real performance. I would also mention George von Bergen 's impassioned grief as Enrico in Donizetti's Maria di Rohan (excellent recitative and clear diction throughout), and Fflur Wyn 's high coloratura aria from Meyerbeer's Dinorah in which the mad heroine imagines herself singing a duet with her goat – surely a most unlikely scenario! For the audience, this was an occasion to sample repertoire from the obscure byways of 19 th century opera, works which many would never have heard of let alone had a chance to see. A rich feast of music it proved to be, and a fine lead in to explore further on CD through Opera Rara's enticing catalogue. There was a change of mood with instrumental diversion during the adjudication discussions whilst waiting for the results. David Worsick gave a virtuoso account of Paganini's Introduction and variations on a theme of Paisiello before Zoe Zeitlin and Jiri Slavik relaxed us with a soothing performance of Dragonetti's Duo for cello and double base . 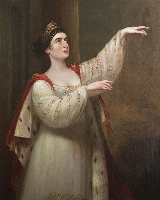 Picture shows Angelica Catalani in the dramatic role of Semiramide (Portogallo) and is taken from RAM's new online catalogue of the York Gate Collections.